Maryland State Police say one person was transported to an area hospital. 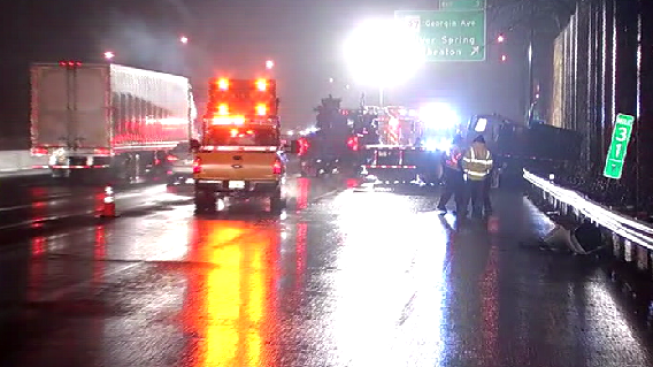 A tractor-trailer jackknifed on the outer loop of the Capital Beltway Wednesday morning, injuring one person and snarling traffic during the start of the morning rush. The accident happened just before 5 a.m. between Colesville Road and Georgia Avenue in Silver Spring. Maryland State Police say one person was transported to an area hospital. That person's condition is not known at this time. Debris from the accident crossed onto the inner loop, damaging several vehicles. The State Highway Administration closed the inner loop for about 15 minutes for debris cleanup. Several lanes on the outer loop were also blocked for a short time, but they have since re-opened. A 5-mile backup has been reported in the area.